Running is often likened to meditation in motion, and many people use running as an outlet to relieve stress and pent up emotions. This is beneficial, but many people also use running as a chance to ‘zone-out’ and either listen to music or play their day through their heads. This of course has it benefits, but it also means you are not fully present in the process of running or allowing yourself a ‘mental break’. However, you can make your running even more effective by training your mind as well as your body, and you can do this by incorporating a level of mindfulness. This is simply the practice of bringing your attention back to the present moment when you notice your mind is wandering into the past or the future. Running is a perfect opportunity to practice this, and through the process you will also start to develop a mental strength to overcome the psychological barriers associated running, and most forms of exercise. 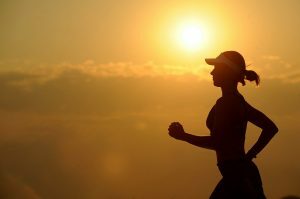 Through the use of mindful attention, you can develop the strength and ability to ignore that little voice of in your head telling you “I’m tired”, “I should stop” or “I’m bored”, and instead tune into the direct experience of running and how your body is feeling – you’ll definitely be clocking up that mileage! 1. Be present in your run – leave the headphones at home and become fully present with your surroundings while you are running. Notice things around you such as smells in the air, the sounds around you, the air on your skin and the view. 2. Tune in to your body – check in with your body while you run and do a quick body scan from your feet to your head. How is your body feeling? Are there any aches or pains you should attend to? Do you need to adjust your gait or stride? 3. Be present in your mind – when you notice your mind wandering to things you’ve done that day or things you need to do, bring yourself back to the experience of running and use your breath as an anchor for this presence. 4. Be present in the process of running – bring awareness to the mechanical process of running, of your foot lifting from the ground and striking the ground. Mindful walking is a key practice in mindfulness and you can do a slightly speedier version of it while you run. 5. Connect with your breath – become fully present with your breathing to support the physiological aspects of running, but also as an anchor to bring you back to the present moment again and again. These tips are certainly not easy to put into practice, and require extra effort, but they may just give you that edge in your running by developing your mental strength, alongside the physical. For further reading on making your running more mindful I would recommend reading; “Running with the Mind of Meditation: Lessons for Training Body and Mind” by Sakyong Mipham. refresh, rebalance and relax the mind and body.